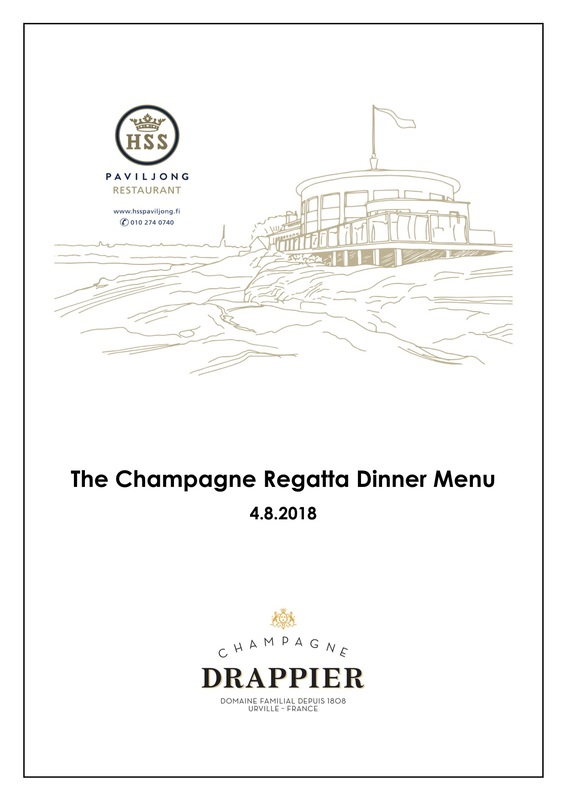 The Champagne Regatta 2018 will be hosted by Helsingfors Segelsällskap (HSS) on the island of Liuskasaari (Skifferholmen in Swedish) in Kaivopuisto. The regatta takes place from Friday, August 3rd to Sunday, August 5h. 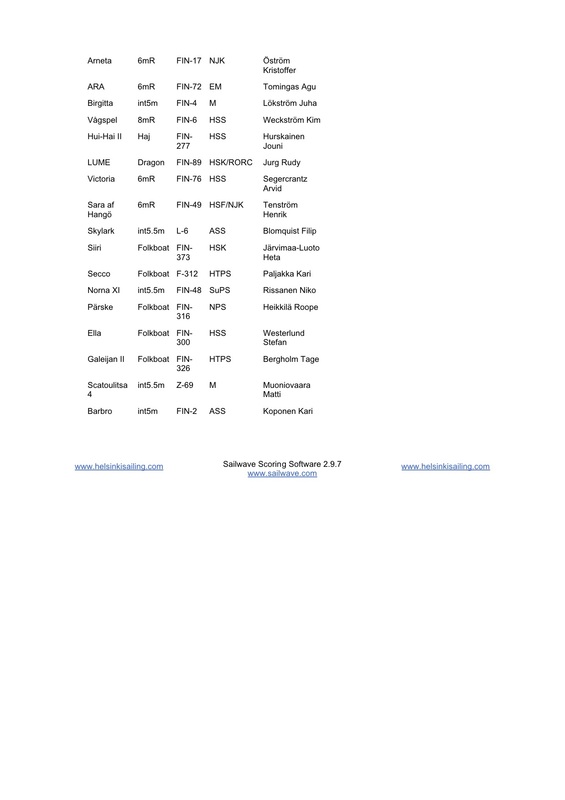 The regatta is open to all boats of Nordic Folkboat class, Star Class, Dragon Class, Haj class, Skerry Cruiser class (SK 15, SK22, SK 30, SK 40, SK 55, SK 75, SK 95, SK 120, SK 150), Finsk Särklass A (A-boat), Diverse Cruiser Yachts, Metric class (5m, 5.5 m, 6mR, 8mR, 10mR, 12mR), L-6 and Racing Schooner class. 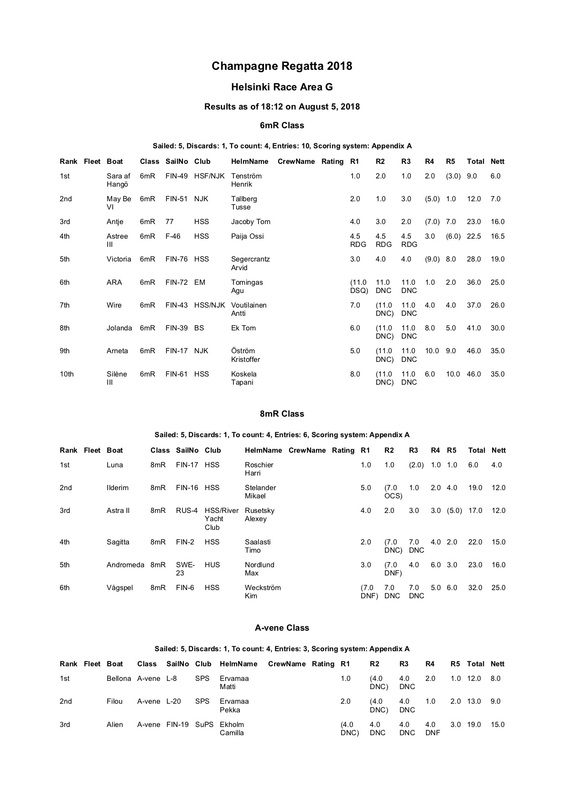 For the Dragons, Haj class 6mR, 5m and 8 m classes the Champagne Regatta is part of their ranking series. 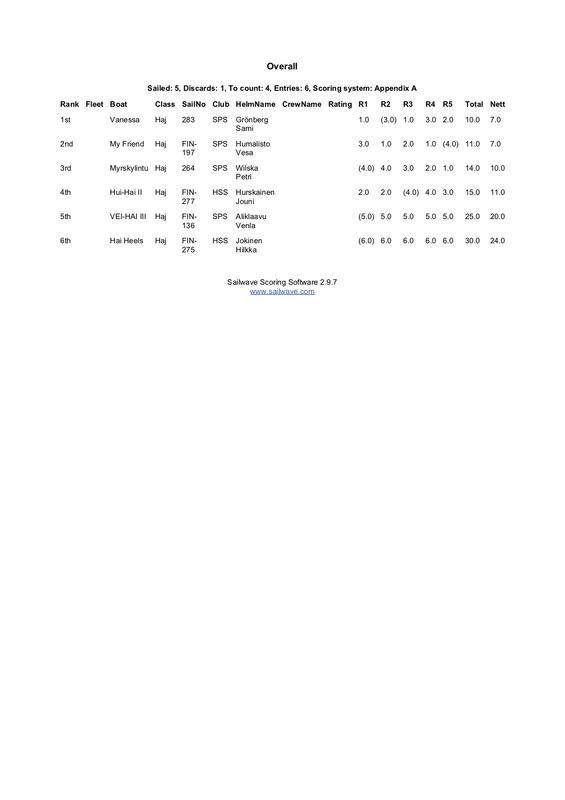 The Champagne Regatta is part of the Baltic Classic Masters series www.sailtrust.org. Every classic boat with handicap is welcome to participate. The Champagne Regatta is one of the major classic boat event in Finland, and it has been organized since 2010. Participating boats will berth to at the HSS. The BCMC boats will race on Friday and Saturday and Other classes start their races on Saturday, August 4th. There will be two races per day. The first race will start at 11am every day. The main race course is situated in the waters just south of HSS Yacht Club, right in front of the HSS Club House, between Liuskasaari and Pihlajasaari. The HSS Paviljong Restaurant terrace and the beautiful cliffs beside offer a perfect location for the audience to watch the races. The HSS Paviljong Rrestaurant is also worthlooking at from inside. Functioning as an Olympic Sailing Venue in 1952 Summer Games, the building was designed by architect Runar Finnilä and the interior art works were mastered by HSS members Björn Landström and Michael Schilkin. We kindly ask you to make the dinner payment to the restaurant in advance at the beginning of the regatta. Please hold on to your receipt to avoid queuing upon entering the restaurant. There will be 240 places available for the Gala Dinner. Seating arrangements will be made before the dinner – (seating arrangement wishes may be sent beforehand to kirsi.raatikainen@mpoli.fi latest Monday July 30th). Dress code is club jacket / sailing (smart) casual. The HSS Western Shed will serve as a Sailors’ Bar on the evening of Friday, August 3rd. The Friday Shed Party will start at approximately 4-5 pm in the Western Shed and it will include food, drinks and music. 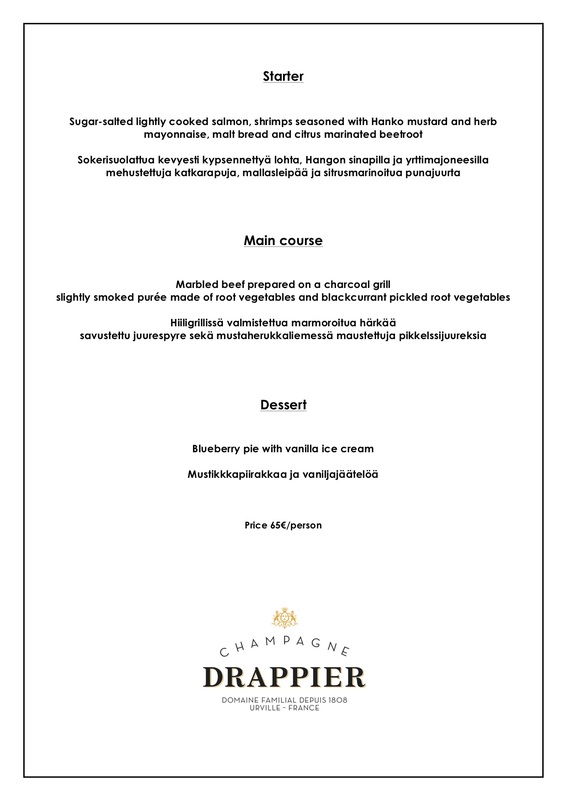 There will be a buffet dinner with bread, salad and meat or fish for the main course. Tickets to the Friday Shed Party are now available on https://holvi.com/shop/helsingforssegelsallskap/product/8de7fad7c5d25d8734f0da81b86327e4/ Welcome! The Western Shed also functions as a breakfast café on Saturday and Sunday – beverages, sandwiches and other finger food can be bought in the mornings 8-10 am before the races. If you want to order takeaway sandwiches before hand please contact us by email (kirsi.raatikainen@mpoli.fi). On the Skifferholmen island there are two restaurants for lunch and snacks: HSS Paviljong Restaurant and Skiffer Restaurant. 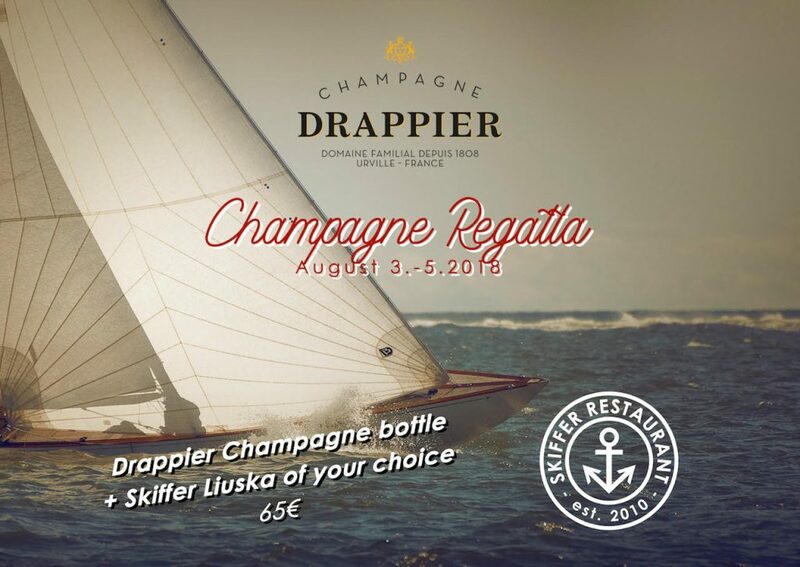 During the Champagne Regatta the after sailing happy hours special offer at Skiffer restaurant is a bottle of Drappier Champagne and a sliced Liuska pizza of your choice for 65,- Welcome! The Premiere of “Sven Joffs – A Legendary Boat Captain” film will take place on Saturday August 4th at 4 pm att the Western Shed. Filmmaker Tapio Saavalainen will be present. 1.2 No national authority prescriptions will apply. 1.3 If there is a conflict between languages the English text will take precedence. 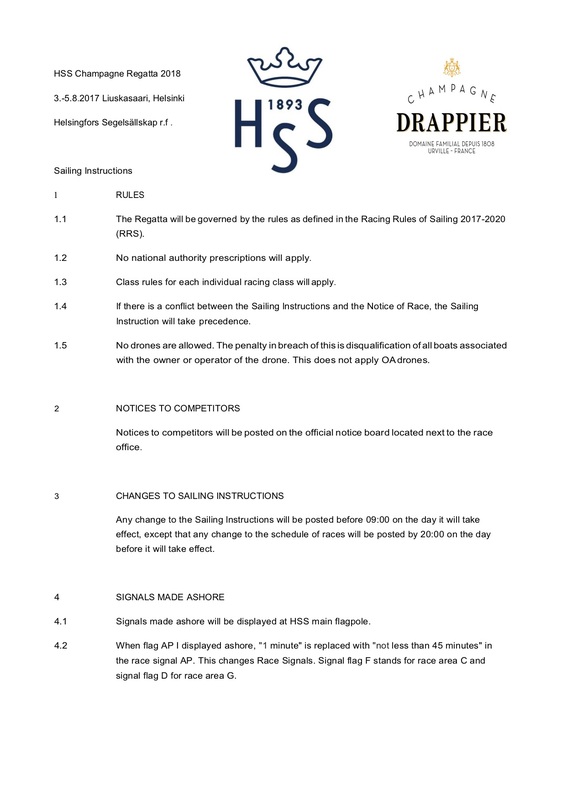 1.4 If there is a conflict between the Sailing Instructions and the Notice of Race, the Sailing Instructions will take precedence. 1.5 A boat may carry national letters and sail numbers other than her own if permitted by Race Committee. This changes rule RRS G2. In accordance with World Sailing Regulation 20 (Advertising Code) as modified, boats shall display advertising chosen and supplied by the Organizing Authority (OA). 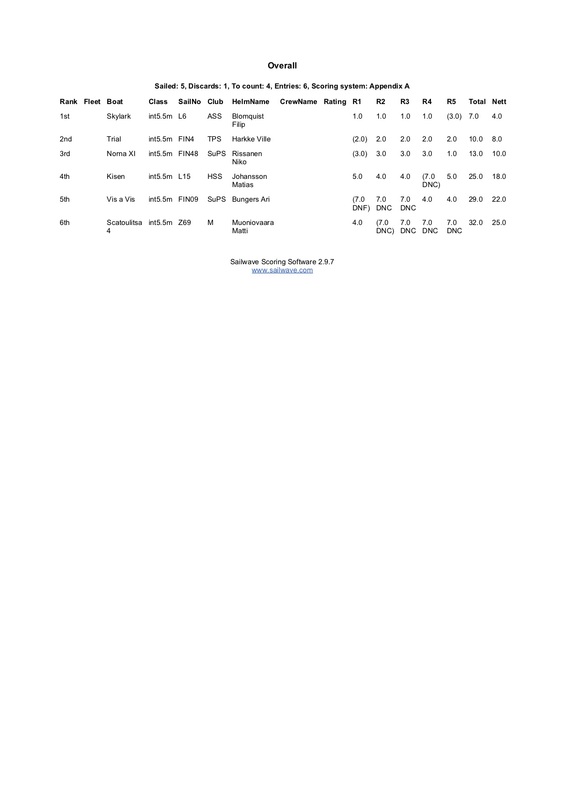 3.1 The regatta is open to all boats of Nordic Folkboat class, Star Class, Dragon Class, Haj class, Skerry Cruiser class (SK 15, SK 22, SK 30, SK 40, SK 55, SK 75, SK 95, SK 120, SK 150), Finsk Särklass A (A-boat), Diverse Cruiser Yachts, Metric class (5m, 5.5m, 6mR, 8mR, 10mR, 12mR), L-6 and Racing Schooner class. 3.2 Competitors shall enter by completing an online entry form on the website of the Organizing Authority (www.helsinkisailing.com). When completing the entry competitors are required to transfer the required entry fee on the Organizing Authority website by using credit or debit card. Organizing Authority is using HOLVI service for the transaction. Entries have to be received no later than June 30th 2018 to qualify the early entry fee. Late entries will be charged 1.50xearly entry fee. The entry fee is non-refundable. 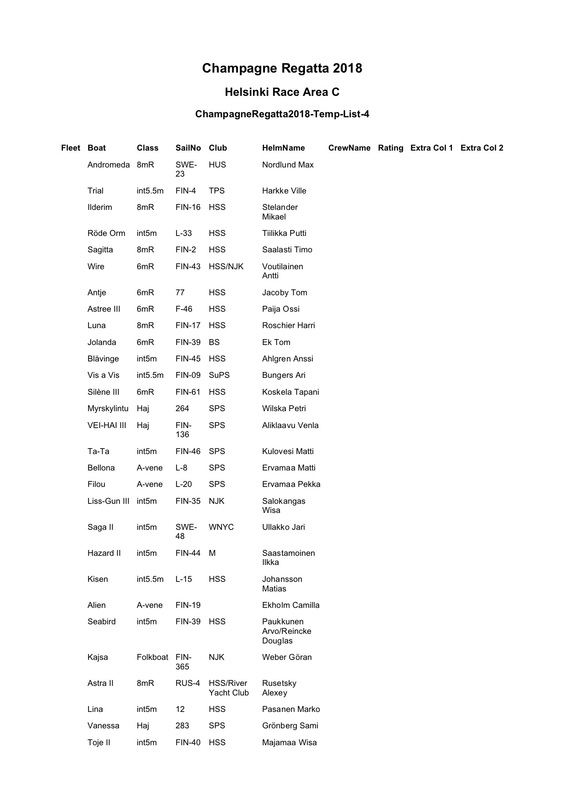 World Sailing Sailor Classification Code will not apply. 6.4 Skippers Meeting for each Class is on the first Racing Day not earlier than 10:30. 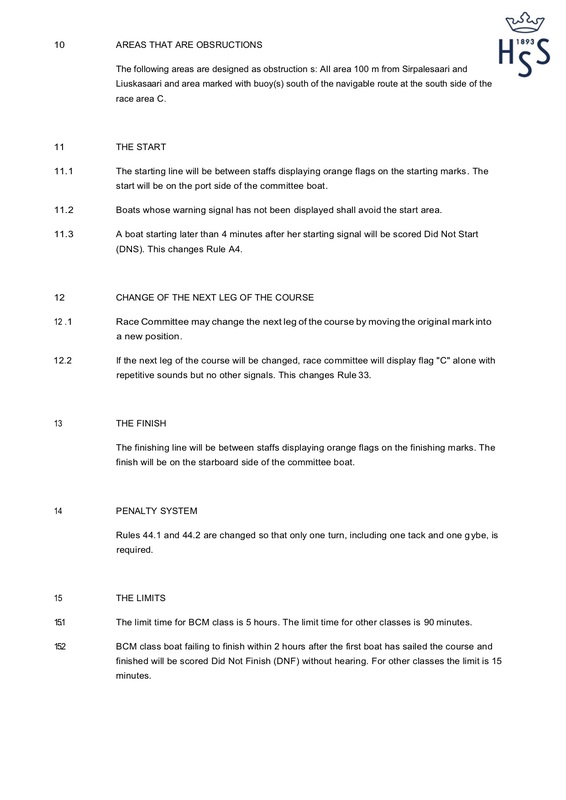 6.5 The scheduled Time of Warning Signal for the first Race each Day is not earlier than 11:55. 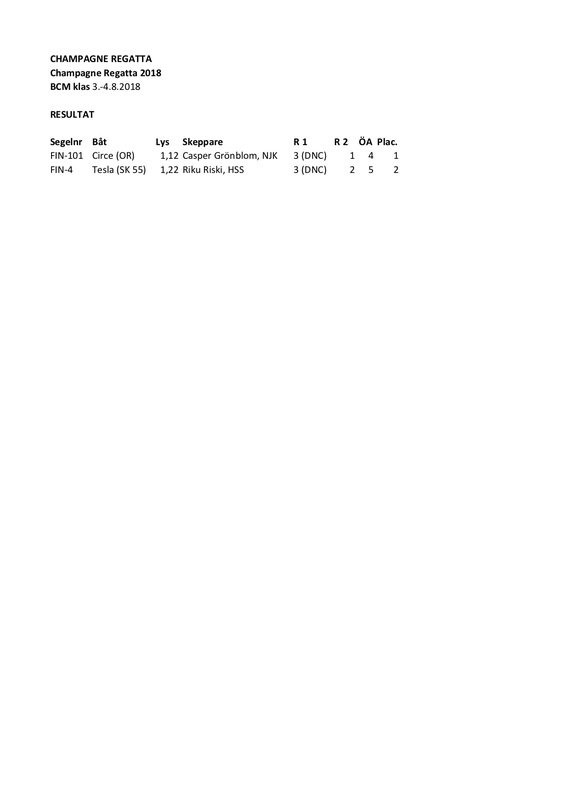 LYS Classes (BCMC) boats shall produce a valid rating certificate (LYS). 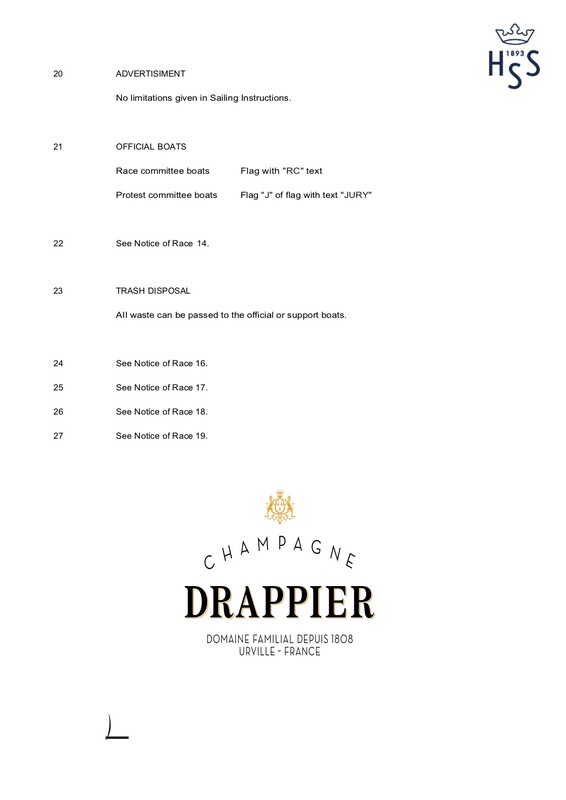 Champagne Regatta Class boats shall produce a valid Measurement Certificate. Each boat and its equipment may be checked on compliance to the class rules and sailing instructions anytime during the regatta. 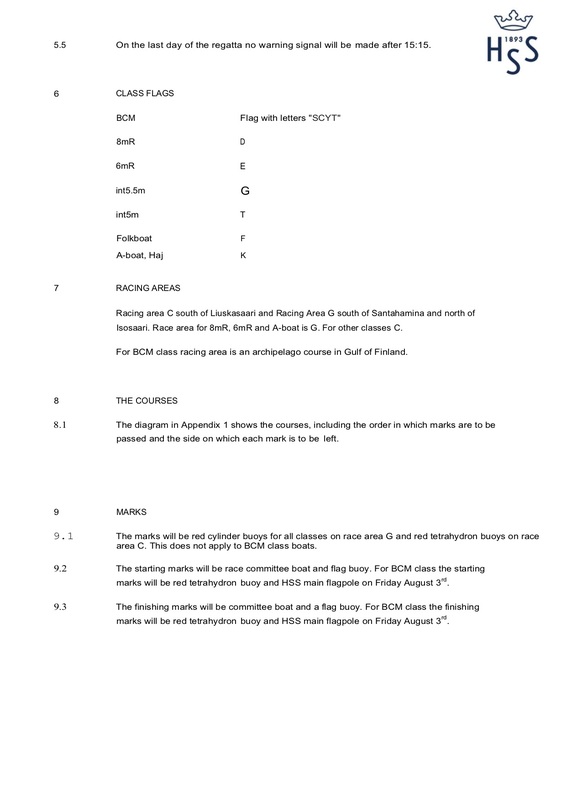 The sailing instructions will be available August 2nd, 2018 at race office on Liuskasaari or on website www.helsinkisailing.com. The racing areas are Helsinki Racing Areas C (south of Liuskasaari) and G (area near to Santahamina and Isosaari). A map showing the racing areas to be used will be posted on website www.helsinkisailing.com. 12.1 The Low Point System of Appendix A will apply. 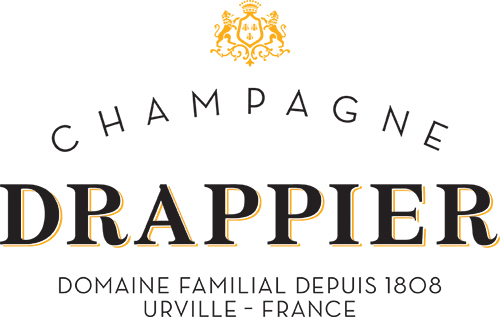 Champagne Regatta Classes will be scored as ca separate class in case of 3 or more entries. Rating system LYS will be applied BCMC and other classes. 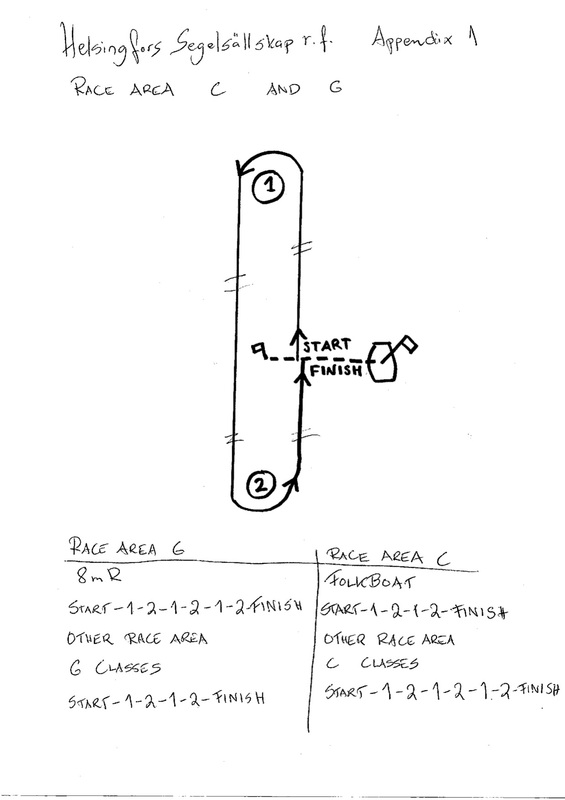 12.2 One race is required to be completed to constitute a series. 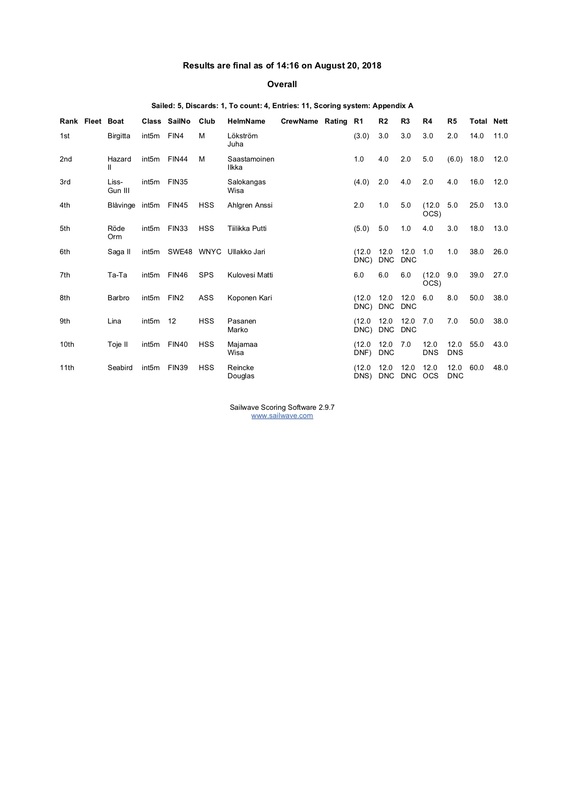 12.3 When fewer than 4 races have been completed, a boat´s series score will be the total of her race scores. 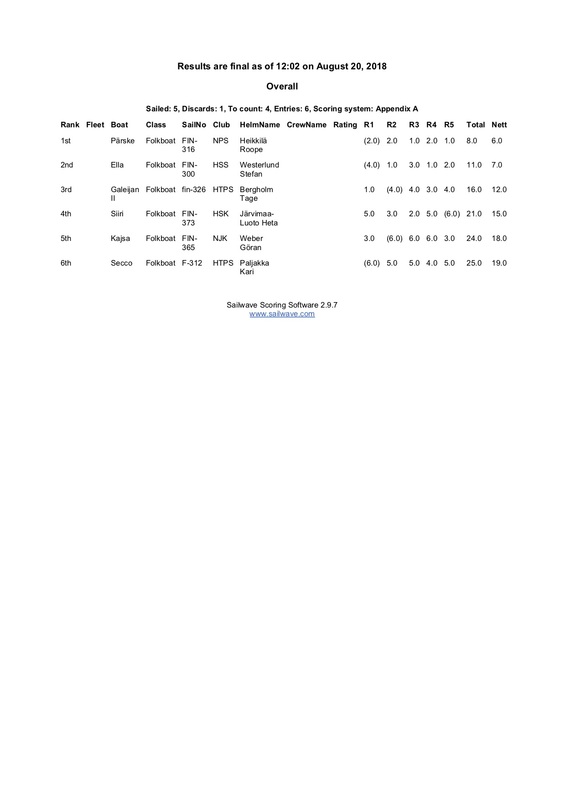 When 4 races have been completed, a boat´s series score will be the total of her race scores excluding her worst score. BCMC boats shall be berthed at regatta harbor HSS Liuskasaari during the regatta. Boats shall be kept in their assigned places in the harbor. Keel boats shall not be hauled out during the regatta except with and according to the terms of prior written permission of the race committee. Underwater breathing equipment and plastic pools or their equivalent shall not be used around keel boats between the preparatory signal of the first race and the end of the regatta. A boat shall neither make radio transmissions while racing nor receive radio communication not available to all boats. This restriction also applies to mobile phones. 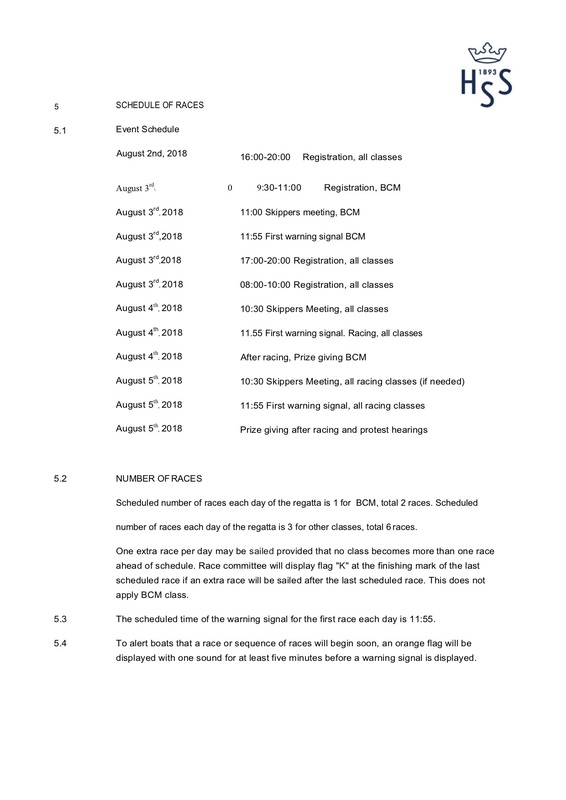 Regatta prizes will be awarded for all separately scored classes and BCMC class. Special prizes will be awarded, too. Competitors participate in the regatta entirely at their own risk. 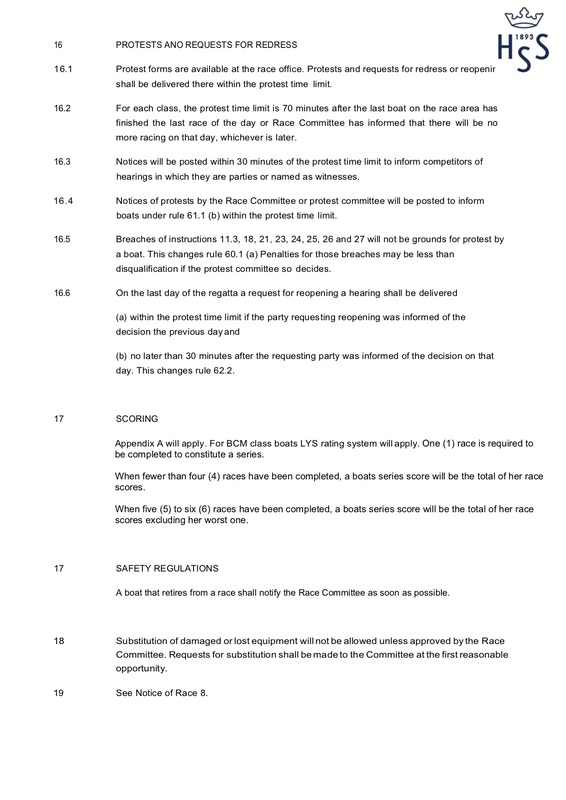 See Rule 4, Decision to Race. The organizing authority will not accept any liability for material damage or personal injury or death sustained in conjunction with or prior to, during or after the regatta. Each participating boat shall be insured with valid third-party liability insurance with a minimum cover of 500.000,00 € per event or equivalent.